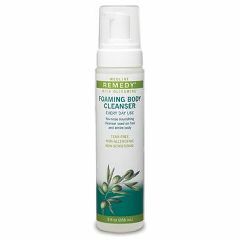 Remedy Foaming Body Cleanser no-rinse formula stays in place to prevent product spills, waste and patient discomfort. One bottle contains more than 340 pumps of foam. Ideal for bedside care or even shower and bathtub use. Remedy cleansers are designed to be biomimetic, a term meaning to imitate nature. Rather than use detergents found in ordinary cleansers, Remedy products use phospholipids that can gently cleanse and condition the skin without stripping it of its natural oils. While all Remedy cleansers are tested to be non-irritating, non-sensitizing, non-allergenic, and non-cytotoxic, the Foaming Body Cleanser has the unique claim of being tear-free as well. My husband uses this product daily to keep himself clean during the day. He uses it on his hands and body and is really pleased with it. EASY To Apply. EASY To Apply. EASY To Apply. TO STAY FRESH BETWEEN BAT. Excellent for times when bathing is just not an option. Safe. Lightweight. Easy Storage. Sturdy. fresh,clean feeling. great shower replacement . Used during hospital stay a couple years ago and loved the clean, fresh feeling it left when I could not shower or shampoo my hair. I use it any time I feel I need a pick-me up during these 100+ degree days. I gave one to each of my female co-workers to try. My husband is on the lung transplant list and I will use it on him after his surgery. The cleanser is excellent for bedside bathing and it's safe for the most delicate of skin types. The scent is very nice, too.